Why is this gray treefrog colored green? These small frogs, only 1.5–2 inches long as adults, change color to match their surroundings. They hide in plain sight – green on foliage, brown on tree trunks and branches, and gray on rocks. When the new, half-inch-long young frogs leave the water and head for the woods in July, they’re green, too, for several days. As spring becomes summer in late June, the trill of eastern gray treefrogs caps off a season of frog sounds. Everywhere in Westborough we’re used to listening to nature, especially in spring as the chorus of birdsong gradually builds. It often starts with a few coos of mourning doves in February and then grows as the “hey-swee-tie” song of resident black-capped chickadees starts. Redwing blackbirds arrive in droves in April, filling cattail marshes with their own distinctive song as males stake out territories. Robins return, with their variable song. By now we’re hearing chipping sparrows in yards and woodland edges, and the liquid song of the wood thrush floats through deep woods. But do we notice the frog and toad breeding songs? They join the bird sounds in a predictable sequence but we often hear them in the evening. Late March brings the piercing calls of spring peepers, which can sound almost deafening near swampy areas. When you first hear the 3-5 day chorus of quacking wood frogs at vernal pools in early April, it’s hard to believe they’re not ducks. Also in April the trill of American toads creates a background hum from wetlands. Then in June the rhythmic bullfrog chorus of “jug-o-rum” begins at ponds. Why are gray treefrogs trilling? Like the calls of other frogs and toads, the gray treefrog’s trill is an “advertisement call” that males make to bring females near. Both male and female treefrogs spend their lives in the forest but go to water for breeding. They particularly like wet areas with flooded shrubs. There they lay and fertilize their eggs, which hatch into tadpoles after about a week. The trill also helps male treefrogs space themselves out around a pond or swampy area. One male won’t get too close to another male’s loud trill. It’s the loudness that counts. And males that broadcast their trills from the best perch sites are often the most successful at breeding. If you’ve never seen a gray treefrog, that’s no surprise. After all, they do spend much of their lives in shrubs and trees, unlikely as it seems. We associate frogs with water, but that’s just where treefrogs (and others) go to breed. Some frogs, such as bullfrogs, do stay close to water year-round, and they’ll actually eat smaller frogs there. So what are treefrogs doing in trees? They’re hunting food – insects, spiders, and caterpillars. What better place to find their prey than among the leaves? 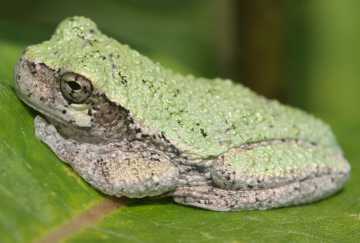 For the same reason, you might spot a gray treefrog near your house. They sometimes hunt the insects that come to porch lights on a summer evening. During the day, you might find one in a nearby bush or planter, or even a bird box. If you’re lucky, you might see one climbing a windowpane! Gray treefrogs can be hard to find because of their remarkable ability to camouflage themselves by changing color to match their surroundings. Their ash-gray color is also the color of our New England granite. They turn themselves mottled brown to match tree trunks and branches. And as this week’s photos shows, they turn green when they sit on leaves or grass. How do they do it? An amphibian’s skin is remarkable in many ways, and the gray treefrog’s skin contains different types of cells that have different pigments and light-reflecting structures inside them. In response to different levels of a certain hormone, these cells can concentrate or spread out the color inside them. Green, for example, is a mixture of blue and yellow, as most everyone knows. Gray treefrogs produce it in their skin when one type of cell arranges its tiny light-reflecting structures to reflect blue light, which then passes through cells above that contain yellow pigment. The result is green camouflage for the frog. And how do gray treefrogs (and spring peepers, also a type of treefrog) manage to climb trees and shrubs, not to mention walls and windowpanes? The secret lies in their toes, which have special swollen toe pads. The skin cells on the toe pads are very flat, and glands in the skin make sticky mucus that works with the moisture on the skin and on the surface that the frog is climbing. The surface tension of water – the tendency of water molecules to attract one another and stick together – holds the toes on the vertical surface. Gray treefrogs live several years if they don’t get eaten. Many other creatures, ranging from birds and snakes to bullfrogs and green frogs, prey on them. Big gray treefrogs even sometimes eat little ones! When caught, gray treefrogs “bark” to startle the attacker. They also have to survive the New England winter. Like wood frogs and spring peepers, they hide in protected places in the woods and allow themselves to freeze solid, at least in part. They survive thanks to special body chemistry, which draws water out of their body cells and into the spaces between cells, where it freezes. Their cells, in turn, fill with antifreeze in the form of blood sugar, which helps the cells resist freezing (unless they get colder than 18 degrees F). All this happens as part of an alarm reaction – a version of the “fight-or-flight” reaction – that occurs when ice starts to form on their skin. But besides treefrog trills, what else can we look forward to now? In early July, you might see tiny baby toads crossing your path in the woods, especially near water. In mid-July another chorus begins as summer insects start making their sounds. August is the month for baby snakes and nesting goldfinches.